What is the value of a black life? Hank Willis Thomas offers an answer in the bold contrasts and sharp lines of The Cotton Bowl. He places a sharecropper and a football player in the spaces in which they generate their “value” to American society. For the sharecropper, his worth is derived from every cotton plant he picks; for the football player, from every clearly marked yard line he gains. The limbs of both figures are defined by sharp, 90-degree angles. This unnatural human geometry raises a critical question: are these men or are they machines? The prominent presentation of cotton plants and the figure of the cotton picker allude to a painful chapter in African American history. By the beginning of the Civil War (1861-65), cotton had become synonymous with the institution of slavery. 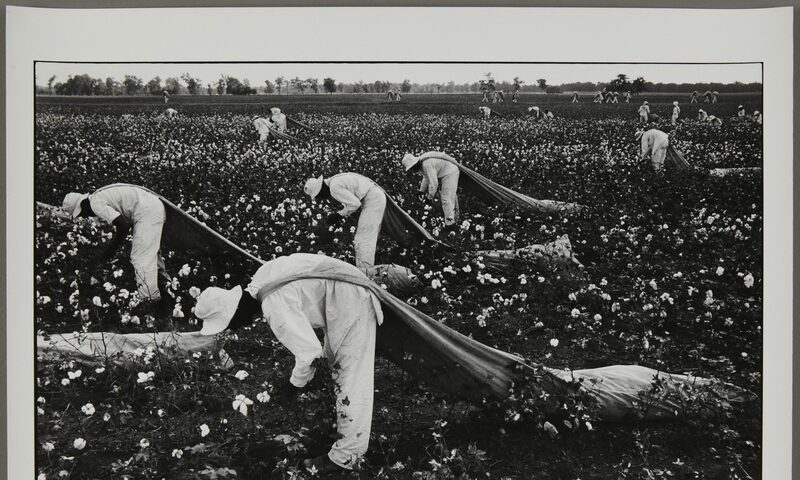 In its aftermath, the exploitation of African Americans took on a new form in the institution of sharecropping. Thomas deliberately placed a sharecropper – as opposed to an enslaved person – in this image. Chattel slavery may have disappeared. But for black tenant farmers, oppression found its new expression in the harsh economic conditions under which they labored and the racist Jim Crow laws under which they lived. Thomas pulls this brutal history into the present. The stances of the two figures mirror each other. The football player is the sharecropper’s modern-day incarnation. The work’s title also suggests this symmetry. College football bowl games, like the Allstate Rose Bowl and Hyundai Sun Bowl, generate massive amounts of wealth for the National Collegiate Athletic Association (NCAA), while its mostly black football players toil without pay.